A Tree Grows in… What?? | Where Did You Find God Today? A Tree Grows in… What?? God spoke to me in volumes about tenacity, strength through adversity, and determination to become the beautiful creation He has in mind for you to be. That car must have been there long before the tree was little more than a sapling. Yet, somehow, this tenacious little piece of bark pushed through metal, leather, springs and rust to stretch out into the sky.Year after year it struggled to grow, and eventually sprawled out beyond the boundaries that contained it. Limbs shot from its ever-increasing trunk until it overcame what had held it back. The same God-given weather – rain, sun, cold and heat – that nourished the tree deteriorated it’s captor. Windows, once hardened by glass, shattered. Metal, once molded for strength, crumbled. What was once an obstacle became a pathway to the light, and a container to guide further growth. 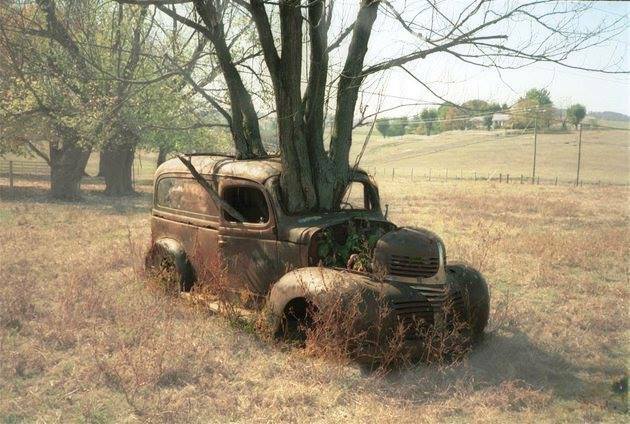 If you are facing obstacles right now, I hope this picture of a tree sprouting healthy and strong from an old rusty car gives you hope. Through the struggle,no matter the diversity you face, you will become what God intended you to be if you don’t give up. Anything is possible if you rely on God. Keep stretching, keep reaching for Heaven’s goodness. God will provide.You will overcome any adversity if you turn to Him. Thank you, thank you for this post this morning! The writing road is a difficult, bumpy, and lonely one. And today I was discouraged. Wondering is it worth it? The hours thinking, seated in front of the computer. Does anyone hear? Do my words make a difference? And I clicked on your blog and read God’s words to my mind and heart this day. Thank you for encouraging me. What a picture and what a life message to each one of us, Julie. A message to speak His words and He will take that message to the one, ones or multitudes who need to hear.